I really didn’t like that poster because it was all about patience and I was all about getting on with the next thing. I was always about what comes next: finish high school, go to university, get the job. It took a long time for those lessons in patience to sink in and for me to accept that much of life is getting ready. 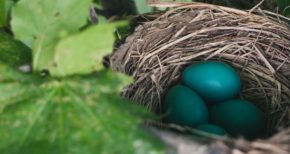 And a lot of the getting ready is hidden, behind the scenes, like what’s going on in those blue eggs in that poster’s nest. It’s a lot like how we spend our summers when we’re involved in teaching that follows the traditional academic year cycle (which excludes our clerks and clerkship faculty who learn and teach year-round). At UG, especially for the upcoming pre-clerkship academic year, we spend a lot of the summer getting ready. The Education Team, Course Directors and teaching faculty are looking at course evaluation reports and looking at where improvements and changes are needed. The Curricular Coordinators are getting everything set in MEdTech so things run smoothly. And a multitude of other behind-the-scenes support team members are quietly getting on with getting ready. While the end results of all this preparation are evident, the tremendous amount of work involved usually isn’t. For planning purposes, we need to think ahead, look at the big picture and always be thinking of the next thing. 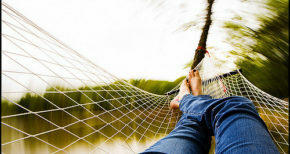 But for teaching and learning, being in the moment matters, too. And, sometimes, you’re in the moments that are about getting ready. Sometimes we dismiss the “getting ready” stage as a holding pattern, as mere waiting. It’s not the “good stuff” or the “important stuff”. But getting ready is every bit as important as what comes next. Without getting ready, the good stuff can’t happen. Think about the last big celebration you took part in (maybe for a birthday or special holiday). Did it involve presents? Did you take some time to find the perfect gift, picking out wrapping paper and bows, maybe a special card? Did the recipient take a moment to appreciate that effort or tear right in? Maybe you were the recipient. Did you savor the moment, or dive right in? My Mom always insisted we read the card first, how about you? Regardless of slow savoring or exciting unwrapping, it was a special moment, that made the preparation – the getting ready – worth it. Sometimes getting ready is taking a breather (as we hope our pre-clerkship students are doing with their summer!) or augmenting skills, and sometimes is doing all the necessary preparation to make things run smoothly for the “big” event. It’s important to recognize that, from a pedagogical perspective, this getting ready – either course prep, or “introduction to” instruction – isn’t wasted time, but necessary steps along the way. So be in the moments of getting ready. Meanwhile, we’ll get back to work reviewing course evaluation feedback, revising preparatory materials and SGL sessions. Looking at which learning event worked well and which need some tweaking and which need a major overhaul. Are assessments well-mapped to learning objectives? Is the rubric clear or can we improve that? What about annotating those objectives…. (And, as always, if you’re in need of help with any of the above, get in touch. We’re here to help). 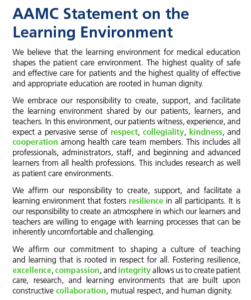 Several years ago, the Association of American Medical Colleges (AAMC) developed and publicized a statement on the learning environment. Medical education and exemplary patient care go hand-in-hand. They feature a pervasive atmosphere (dare I say “culture”) of mutual respect and collaboration on the part of all involved in the delivery of patient care. Everybody involved is both a learner and a teacher, and feel free and comfortable in both roles. Lofty goals and expectations, to be sure. In fact, the skeptical among us may consider these to be merely aspirational statements, expressing unachievable ideals. I’m pleased to report that this is not the case. In my experience, I often encounter learning environments that are nicely meeting those lofty goals. Most commonly, these are in large teaching hospitals where available resources, space and academic focus combine to produce close-to-ideal learning environments. Recently, I had the opportunity to see similar success in a much smaller site. 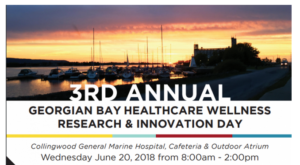 I attended the Third Annual Georgian Bay Healthcare Wellness Research and Innovation Day held at the Collingwood General and Marine Hospital. 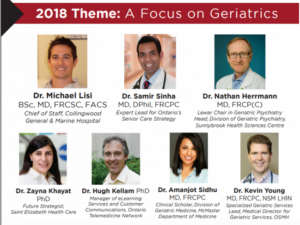 Organized by Collingwood Chief of Staff Dr. Michael Lissi and supported by Dr. Peter Wells and Program Manager Michelle Hunter of the Rural Ontario Medical Program, this year’s theme was Geriatrics and involved a thoughtful panel discussion followed by a series of very well-qualified and engaging speakers. The hospital cafeteria, re-purposed for the occasion, was standing-room-only as about 150 folks from all areas of the health care community, as well as interested local residents, packed the room and contributed to the discussion. The sessions were live-streamed to several sites. In addition to the presentations, hospital corridors were used to feature about 60 posters featuring studies carried out by local practitioners and learners working in the community. I was there largely because two of our students who are in Collingwood completing placements. 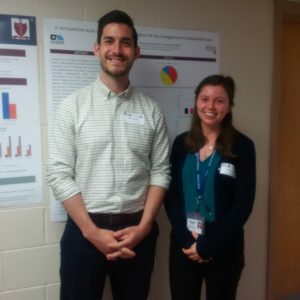 Claire Tardif and Daniel Weadick of Meds 2019 are, by all accounts, both enjoying the experience and learning a great deal. They’re integrating well into that local learning environment, working with multiple physicians, other learners and health care providers. Dan summarized it all rather effectively. In his own words “there’s a lot to like”. For me, the whole experience was a little surreal. 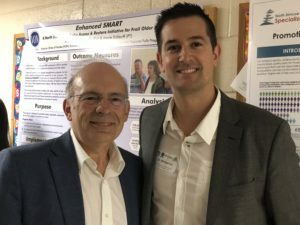 Having grown up in Collingwood and worked in the various jobs in and out of the local hospital, I found myself reviewing posters and meeting local physicians in the same rooms and corridors in which I’d made deliveries and portered patients many years ago. learned through largely classroom and simulated settings are insufficient unless integrated and applied to real patients. That process of application must be progressive, beginning with highly supervised settings where learners can begin to experience clinical care and decision making in safe and nurturing environments, while at the same time allowing them to progress to increasing levels of independence as their skills and growing confidence allows. For the medical student, highly-structured and learner-dense academic hospital settings are certainly valuable and essential, but may provide unintentional “ceilings” to professional development, and limit the appreciation of continuity of care that occurs outside the specialized ward and is so critical to patient outcomes. Community placements in smaller centres can complement their learning by providing that context. In the end, medical education is fundamentally about providing and identifying environments where motivated, talented students can encounter generous and welcoming practitioners in settings that strive to provide excellent patient care and learning for all involved. I’m pleased (and perhaps a little proud) to say that my home town is one of those places.